For centuries the Chinese have talked about an all natural herb and its ability to bring back hair to its original natural color. Now for the first time in centuries, Natures Elements has brought this time-tested Chinese formula to the U.S. It's called Shou Wu which translates to "the man with dark hair" in Chinese. 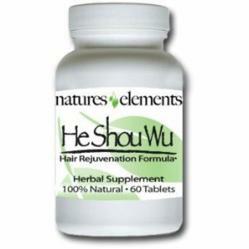 Leading gray hair supplements Shou Wu and Fo Ti are now available at Natures Elements. Shou Wu is a native specie of China and serves as one of the most powerful herbal medicines that aids in a significant number of ailments. This amazing herb is extracted from the natural nutrient rich root of the Wild Eastern Rose Plant. Shou Wu is scientifically termed polygonum multiflorum and is a close relative to resveratrol. Both Shou Wu and Resveratrol have been suggested to extend lifespan. Fo Ti has been known for restoring natural hair color and preventing it from graying. People who have used Fo Ti have seen a high percentage of improvement in reducing gray hair and notice that the hair gradually returns to its original color. In addition, Fo Ti also has been known to help relieve pain within the knees, relieve lower back pain, and boost the immune system. The Fo Ti herb is used as a tonic that improves the endocrine glands, and the overall health, stamina and resistance to ailments. Fo Ti is also used in reducing cholesterol because of the herb’s lecithin component. Fo Ti may also help to promote proper red blood cell generation and resist colds. Recent studies shows that the herb Fo Ti can also help in improving the cardiovascular system, slow down gland degeneration, increase the antioxidant activities in the body, and slow down the aging process. Natures Elements provides customers with the purest and most potent form of Shou Wu as a 12:1 Extract. What is an extract? One way to gauge the potency of Shou Wu is by finding out if it is an extract. Extracts can be 10, 20 or even 100 times the concentration of a powder. For example if a 500 mg tablet of Shou Wu powder was compared to a to a 500 mg tablet of Shou Wu 12:1 extract, results would show that it would take twelve 500 mg tablets of the powder to equal one 500 mg tablet of 12:1 extract. These results clearly are in favor of the extract. The irony is that powders are often marked up very high, and while extracts cost vitamin companies much more it might not cost the consumer more. Here's one way to look at it: now that it is known that twelve 500 mg powder tablets equal one 500 mg 12:1 extract tablet; consider that the extract version costs 3 times more; the consumer still gets close to 7 times more Shou Wu, so the value clearly lies with the extract. Also remember that the higher the extract ratio is, the more potent and concentrated it is. This 12:1 extract ratio is contained in both Natures Elements Original Shou Wu and the Advanced Shou Wu Formula. Some competitors selling Shou Wu often sell less potent products requiring a dosage of up to 3 tablets, 3 times a day or more. That's a total of 9 tablets. Because Natures Elements Shou Wu is so concentrated consumers only need to consume 2 tablets a day. Natures Elements is one of the few companies around that makes it easy for customers to feel safe and secure when ordering. They also offer the convenience of Auto-Ship, which provides automatic monthly shipping with the advantage of receiving 20% off every bottle. This Auto-Ship discount can also be applied to products that are already on sale.